CAD-CAM that provides Art modules for artistic CNC manufacturing allows artists and custom woodworkers to make amazing parts. Francisco Rodriguez Guillen is a Costa Rican artist who combines cabinetmaking and art with CNC machining technology to produce stunning finished projects. He expresses his job is cabinetmaking while his passion is Marquetry, or inlay type craftsmanship and artistry. Marquetry is an art which originated in the Middle Ages, in the Muslim world. The origin of its name is French (Marqueté) and is synonymous with the word “inlay”. Francisco studied music at Universidad Nacional (Costa Rica, 1990 – 1994) and after that he studied cabinetmaking in Instituto Nacional de Aprendizaje (National Learning Institute, Costa Rica, 1996 – 2000). Since 1994 he works in his own company where he focuses on cabinetmaking and his art. 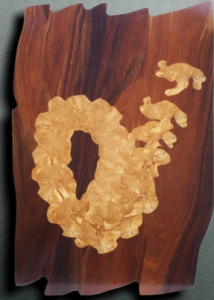 Francisco started as an artist in working with custom woods in 1995 and has specialized in Marquetry (inlay) since 2000. He has no mechanical engineering background, has no CNC machining experience and has never used CAD-CAM software before, yet he saw the potential and decided to take a chance on technology as the means to expand his vision and automate the process. 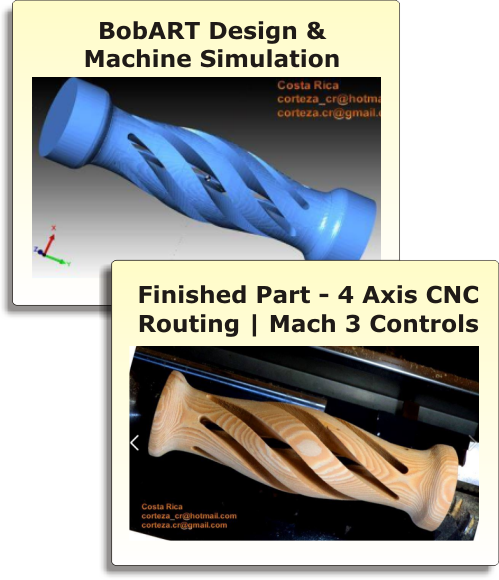 He chose BobCAD-CAM software for its ease of use and powerful artistic capabilities for CNC woodworking. As a result of the work that Francisco has done to present his work online since January 2010, more than 40 artists have recognized and congratulated him (Britain, Spain, France, Italy, Germany, Russia, Serbia, Canada, United States, Colombia, Brazil, Argentina and Australia), one of them being Paul Krenz who is the renowned German artist of Marquetry. Francisco first got involved in CNC machining 2 years ago and acquired his first CNC router with a 4th Axis and a Mach3 controller in February 2013. 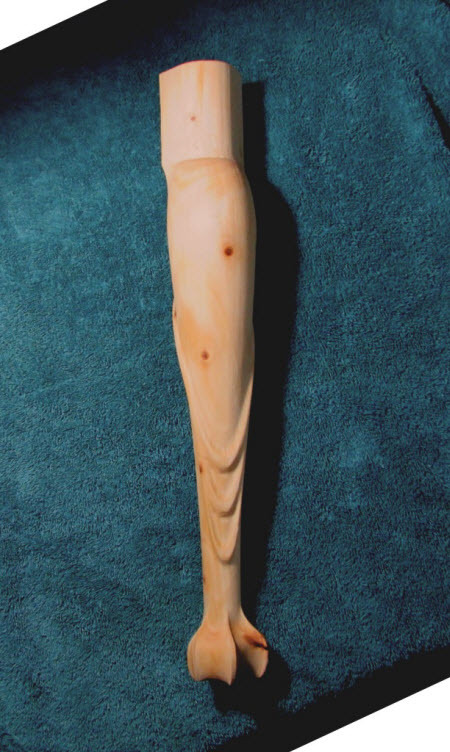 At the same time he acquired a license of the BobCAD-CAM CNC programming software and the BobART artistic add-on module in order to create his designs and then machine them out of different types of wood. 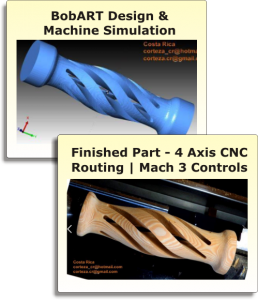 “I really like the difficult challenges to my imagination my CNC router and to my BobART software”, said Francisco in a recent letter he sent to BobCAD-CAM. His latest design and CNC project with the BobART artistic add-on software is a custom cabinet project. Francisco took several weeks to finalize the design exactly the way he wanted it. 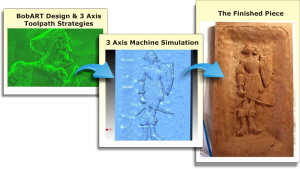 Once the design stage was complete he generated the toolpath strategies and simulated the part using the BobCAD-CAM CNC software. Then he generated the NC program for his Mach 3 and machined the part. The result turned out exactly as he expected from the simulation stage of the project; leaving the classic aged finish texture he was looking for while leaving the relief surface finish rustic and unique looking. Francisco’s next project featured a Solomonic style design finish that is generally used in crafting classic furniture legs. This material stock is 20 cm long and 6 cm in diameter. With the power of BobCAD-CAM software and the BobART add-on Francisco was able to create efficient 4 Axis toolpath and the NC program for the part that only took 90 minutes to machine. A cycle time that would have taken days to machine without CAD-CAM Software or the BobART system due to the intricate design and 4th Axis machining program that was involved. 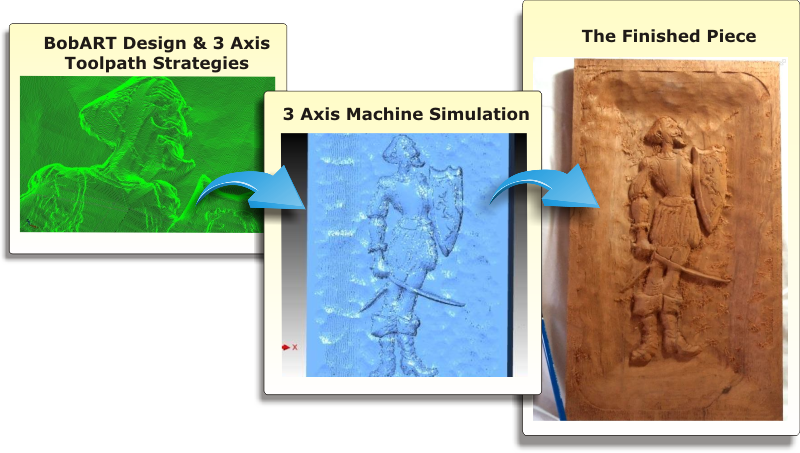 The BobCAD-CAM software makes the toolpath based off of the design and then converts the toolpath into an exact numeric language or G-Code format that the Mach 3 requires in order to correctly run the machine. This is called, “Post Processing”. One of the things that makes Francisco’s work unique is that he generally uses hand selected aged material that is filled with character. Everything is recycled. Francisco loves to reuse wood. Everything from used wood floor foundations from old houses to antique oak poles, wooden farm house material and barn siding can all be used to make artistic designs that are magical when finished. “Someone gave me some old farm posts that have had at least 50 years of sun and rain on them”, commented Francisco regarding the project he was working on. The machining uncovered a significant beauty after several longitudinal cuts out of the aged and weathered hard oak material on the CNC Router. For years Franciscos passion had only been his Marquetry work. However now, this has changed to Marquetry and CAD-CAM software. 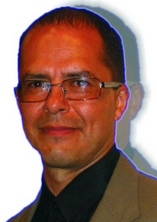 “The possibilities of embossing that the BobART section of BobCAD-CAM allows is almost infinite”, says Francisco. For more information on CAD-CAM software for artistic CNC manufacturing please call 877-262-2231 or 727-442-3554. 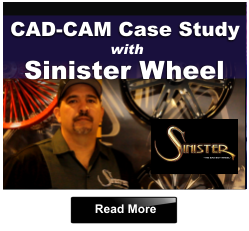 Download a FREE CAD-CAM software trial with artistic design and CNC programming capabilities HERE.